Yesterday, June 21st, was the summer solstice, a.k.a. the longest day of the year. To celebrate the summer solstice and the beloved, ancient practice of Yoga, over 1,500 of Indianapolis’ yogis congregated on Monument Circle for the 3rd year of the city’s largest yoga event aptly named, Monumental Yoga. Monument Circle was turned into a giant yoga mat, while six different teachers from yoga studios across Indy lead the city through flowing yoga classes. The event also featured a Yoga Village with local artisans, restaurants, musicians and vendors. There was music from DJ HyFi along with acro yoga, hooping demos and guided meditation. All the funds raised during this event benefit Mighty Lotus, an organization that brings yoga education and mindfulness to inner city schools. On the hunt for a yoga studio of your own? 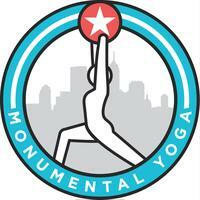 Check out the partner studios of Monumental Yoga, and find one to link up with in your neighborhood.